Mason Appleton threw the puck towards the net from the left wall that hit a body, but the puck bounced to Andrew Copp at the top of the crease. Copp shot it blocker side on John Gibson and in. 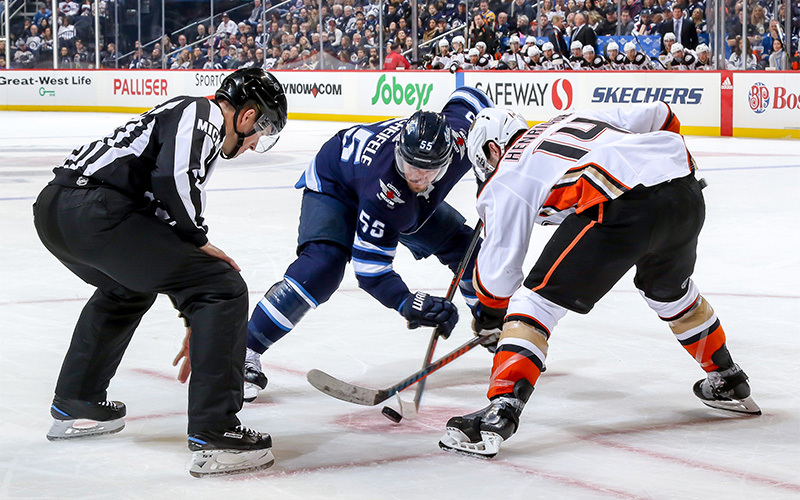 Jacob Trouba picked up the puck behind his own net before sending a pass to Jack Roslovic behind the Ducks defence at the Anaheim blue line. Roslovic moved in alone and fired it under the arm of Gibson and in. Josh Morrissey held the puck in at the right point, moved down the wall and sent a pass across to Kyle Connor. Connor then found a streaking Blake Wheeler in the slot. His initial backhand was stopped, but Wheeler knocked the rebound past Gibson and in. Bryan Little picked up the puck at the Jets blueline and broke in two-on-one with Dmitry Kulikov. Little passed to Kulikov at the Ducks blue line. Kulikov moved to the bottom of the left circle before sliding a pass across the crease to Little who redirected the puck up and over the left pad of Gibson and in. Mathieu Perrault picked up the puck on the left wall, moved to the bottom of the left circle and fed Jack Roslovic at the top of the right circle. He fired a wrist shot blocker side on Gibson and in. Andrew Copp fed Brendan Lemieux behind the Ducks. Lemieux moved out front and beat Gibson on a wraparound to the far corner. Cam Fowler carried the puck into the Jets zone and sent a pass to Nick Ritchie at the top of the left circle. Ritchie snapped a shot blocker side on Connor Hellebuyck and in. Nick Ritchie flipped a backhand to Daniel Sprong behind the Jets defence. Sprong moved in alone before lifting a shot over the blocker of Hellebuyck, off the post and in. Mason Appleton chipped the puck past an Anaheim defender at the Jets blue line, moved into the Ducks zone, and from the bottom of the left circle sent a pass across the crease to Tyler Myers, who redirected the puck over Chad Johnson and in. While on the power play, Jacob Trouba fed Bryan Little in the right circle. Little found Jack Roslovic in the slot where Roslovic one-timed a slap shot blocker side on Johnson and in. Jack Roslovic fed Ben Chiarot at the left point. Chiarot snapped a shot that was redirected by Bryan Little and beat Chad Johnson. Michael Del Zotto snapped a shot from the left point that was redirected by Devin Shore over the blocker of Hellebuyck and in. Extended their home winning streak to seven games and have won 11 of their last 13 games at Bell MTS Place. Recorded their 20th home win of the season to improve to 20-6-2 at Bell MTS Place. Are 2-0-0 on current three-game homestand. Set a franchise record for most goals in a period with six goals in the first period. Tied a franchise record for most points in a period with 15 in the first period. Had 13 players register a point in the first period, including goaltender Connor Hellebuyck (1A) and 15 players overall recorded at point tonight. Improve to 19-5-2 when scoring first this season. Improve to 18-3-2 when leading after the second period. Went 3-for-4 on the power play tonight and are now 18-for-43 (41.8%) in their past 12 home games. It’s the fourth time this season the Jets have scored three power play goals in a game. Had two assists tonight for his first career multi-point game. Extended his point streak to three games with an assist in the first period (3G, 1A). Had a goal and an assist in the first period for his second multi-point game of the season. Played in his 600th NHL game, registering his fourth assist of the season. Led the Jets with four blocked shots tonight. Scored in the second period to extend his point streak to three games (1G, 2A). Led the Jets with 20:22 TOI. Scored twice in the first period and completed the hat trick in the second period for the first multi-goal game of his career. Added an assist in the third period to give him a career-high four points. Tied a franchise record for power play goals in a game with three. Led the Jets with four hits tonight. Had two assists tonight, marking the second consecutive game he has registered two assists. Extended his point streak to three games with a goal in the first period (1G, 2A). Registered three points (2G, 1A) tonight. It’s the second time this season Little has registered three-or-more points in a game. Had two assists tonight. It’s Chiarot’s second two-point game of the season and fourth of his career.